America's greatest party and America's most colorful city, in all their shades, shimmer here in a never-before-published 1950–1960 collection of photographs taken at New Orleans's annual Mardi Gras. 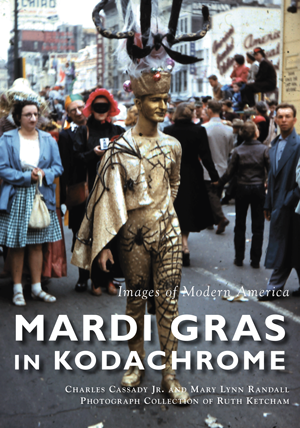 Photographer Ruth Ketcham chose the revolutionary Kodachrome slide film to capture Carnival, its walking and parading krewes, bystanders, and masquers. Kodachrome's fade-resistant images preserve a bygone 1950s era, not only of Mardi Gras but also of a bustling French Quarter, alive again with Regal Beer ("Red beans and rice / And Regal on ice"), Dixieland jazz clubs, the burlesque dancers and temptations of Bourbon Street, and the shopper's paradise that was Canal Street.